Last Saturday at the 9 a.m. playgroup (which is the quietest of all the playgroups at The English Schoolhouse, by the way...I think because most of us like to sleep in on the weekend), I hung out with a pair of sweet sisters, Francesca and Elisa. After we did our routine (play a bit, chat a bit, calendar and morning routine, etc.) I read them one of my favorite stories. I know I say that about almost every book...but it's the truth! I have so many favorites. This is my favorite page from the story. 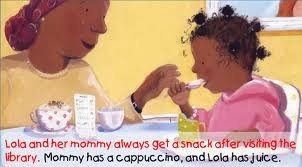 I love the cappuccino illustration, especially the foam. After reading the story, we talked about some of the sisters' trips with their parents to the library. They go often, they told me. We jotted down some good vocab words, like library card (tessera) and the phrasal verb 'to check out'. Then, like always, we did an activity that went with the story. I call it Reader Response Art. 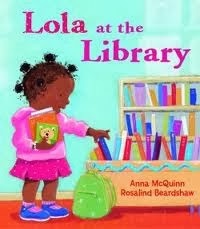 We made Lola with one of her favorite things...a library book. The perfect pieces to hang up in their library at home.